Dominic Bedini died on June 7, 2004, a day after the 60th anniversary of his parachuting into Normandy on D-Day. It was just one of many battles he fought — the first of them when he was only a child. “The Dominic Bedini story could rival the greatest war stories to come out of Hollywood,” said broadcaster Paul Baker, a lifelong friend and golfing partner of Bedini. A member of “The Screaming Eagles,” the 101st Airborne Division, “Poni” Bedini was wounded three times during World War II. The C-47s that flew them into France on D-Day had mistakenly dropped them prematurely and in widely scattered areas. Most of them lost contact with one another and many were wounded either in their descent or on landing. One of the wounded was Bedini. When American troops that had landed from ships made it inland, they found Bedini lying on the ground where retreating Germans had left him. Attached to his uniform was a handwritten note in English signed by a German army doctor. It said: “I did all I could do for this man. I hope he survives.” The note included a signature and the fact that the German doctor had attended Michigan State University. Bedini did survive and returned to duty. He fought in Holland, where he was taken prisoner by the Germans, but was soon released as part of a prisoner exchange for a German officer. He went on to fight in the Battle of the Bulge. There he was seriously wounded by machine gun fire, and spent more than a year recuperating in military hospitals. This, from a man who had battled polio as a child. 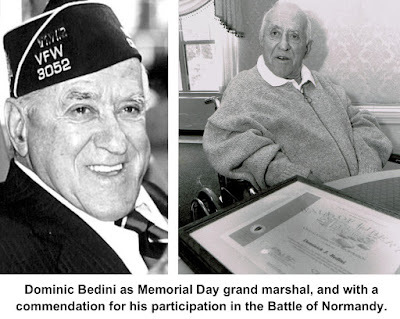 Dominic J. Bedini was born in Ridgefield in 1920 and attended local schools, but his education was delayed by illness. As a child, he contracted polio, and required many months of treatment. Bedini attended Ridgefield High School but left before graduating. He did not officially graduate until the year 2000 under a special program that awarded diplomas to veterans whose educations were interrupted by war. He was 80 years old when Dr. Ralph Wallace, then Ridgefield’s superintendent of schools, presented him with a diploma at Laurel Ridge nursing home. A mason, Bedini had worked for Morganti Inc. for many years and later for Ippoliti Construction Company. He retired in 1985, enjoyed gardening and golf, and was 84 at his death. Although he was awarded at least two Purple Hearts and many other military commendations, Bedini rarely talked about his war service. In the late 1990s, however, friends and community leaders convinced him to be grand marshal of the Memorial Day Parade.